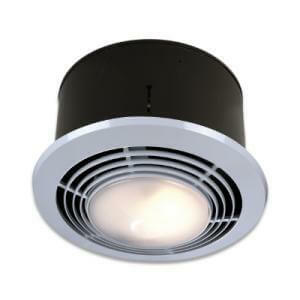 Last week, our electrician installed a new bathroom exhaust fan in our green hall bath. During the install he made a shocking discovery — the old fan hadn’t worked properly since day-one. It was doing nothing. Zero. Zilch. Nada. Apparently this problem is somewhat common, so I made a video to help others learn about my bathroom fan problem and why it wouldn’t work. Since beginning construction on my retro pink master bathroom, the hall bathroom has been seeing a lot more action. We’ve never had guests complain about the moisture issues in there, even though we knew they existed. But when we started using it full time ourselves, we realized just how bad it was. So when the electrician returned to finish working on the pink bathroom, I asked him to install a new fan in the green bathroom too. Before we began work on the pink bath, both fans vented into the attic instead of outside. That’s a code no-no these days. Also stupid, because you don’t want wet moist air pouring into your attic. The fan in the green bath didn’t seem to do much other than sound like an airplane landing — our towels wouldn’t dry and funk grew back quickly on shower tiles as soon as four or five days after being cleaned. As long as we were paying the electrician to come finish up our master bathroom work and vent that fan out of the roof, we had him replace and vent our hall bath fan at the same time, saving $$$ since he could do it all in one trip to our house and one trip into the attic. When the electrician removed the old fan he discovered a problem that went back to the fan’s initial install: The damper that opens when the fan is on (to let air out through the ductwork), and then closes when the fan is off (to prevent back drafts), was stuck in the closed position. This meant that no air could be pulled out of the bathroom through the fan. The reason the damper wouldn’t open was that when the ductwork was attached to the fan, it was mushed up against the damper, impeding its ability to function. 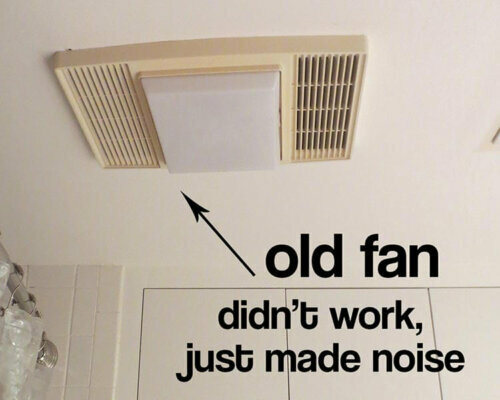 The old fan — probably installed in the 1990s — never did anything but use electricity to make noise for all that time. Since the installation of the new fan, we’ve noticed a huge difference. The mirror is no longer completely fogged when we get out of the shower — in fact it usually has no fog at all. Also, our towels have been drying and there has been no “funk” regrowth since the last bathroom cleaning. The moral of the story here — if you suspect the fan in your bathroom only sounds like it is working, it might be worth checking (or having a professional check) the exhaust vent. If the damper does not move freely, or there is an obstruction in the ductwork, your bath fan may not be able to do its job. 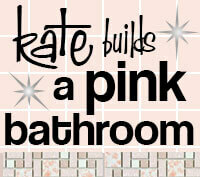 Read all of the stories related to my pink bathroom remodel project here. I think people don’t value bathroom fans enough. I personally like the Panasonic brand and I tend to buy a bigger fan than recommended for the space. Fans and water softeners keep baths clean longer! Glad you solved another household problem. YES! The last house I lived in didn’t have a bath fan. I’m glad to have them now — especially when they work properly. I also bought slightly more fan than needed for the space…mostly because of the moisture problems I’ve been having in those bathrooms. This got me thinking about how well our bathroom fan works (or doesn’t work) which we had installed only a year ago…I think we might have this very problem! Thanks for the post. You are welcome! Hopefully you have an easy fix! 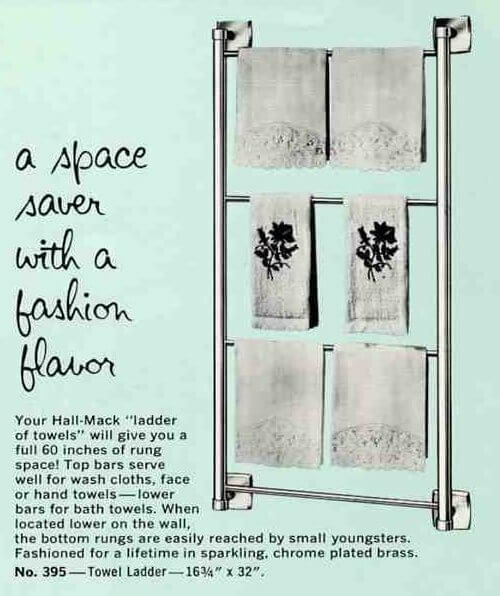 We just had a similar revelation about our original 1952 bathroom fan. We also knew it was barely working (though producing plenty of noise), so during our recent tub-to-shower conversion—-which, as an aside, was just finished yesterday after 19 WEEKS of assorted mishaps!! !—-but I digress. We had the fan replaced early on in this project. It vented to the outside as it should have, but when the electrician removed the fan, he found the duct almost entirely blocked by an old bird’s nest!! I didn’t know about that until the new one was all installed and the work done, or I’d have kept the old one—I think it would have worked fine again with a cleaned-out duct! One thing I couldn’t get them to remedy (at least not willingly) is that the fan and the light are on the same switch, so if you want light, you get the fan. There are, thankfully, great vertical sidelights on my medicine cabinet, which I leave on all day, but it is annoying to have the noisy fan when you don’t need it. (It does work, though). Boy, we sure do learn a lot with these projects, don’t we? In my hall bath there are lights over the vanity so we can turn those on without the fan/light. In our pink bathroom, I had the electrician wire one switch for all the lights (fan light, over vanity and ceiling fixture) and then put the fan on a timer switch. He also made it so we could put the fan and light on the timer (or another switch) easily if we changed our minds later. Our last bathroom had like 3 different switches for lights and we would accidentally leave one on all the time…not anymore! Not new to me, Kate. We had the same problem with birds in our old condo. Small sparrows, especially, love to get into the vents for dryers, bathrooms, etc. It was very funny that it took us a couple of springs before we figured out where all the cheeping was coming from in our downstairs powder room. We finally saw the parent birds flying in and out of the vent flaps with worms in their beaks. Then, of course, we disconnected the fan rather than kill the cute birdies! A simple solution is to install a wire cage over the vent so small animals–mice, birds, etc.–can’t get in. Would you believe that neither of our bathrooms have a fan installed? I don’t know if that’s a flat roof thing or a dumb prior homeowner thing but we have no bathroom fans and likely no ventilation installed for them. Depends on the building code in effect when your house was built. 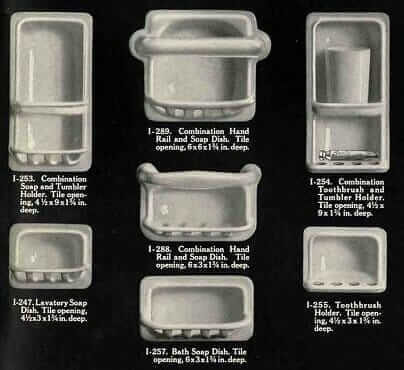 I assume you have operable windows or skylights in your baths which at one time was considered adequate ventilation. I grew up in a 1920s era rowhouse that had an old fashioned chain operated skylight over the tub. mine is a 1954 ranch. My Mother-in-Law’s old place was the same way. They used a HUGE dehumidifier in the winter & opened the small skylight in the summer. To test how well (if at all) your fan works, stick a single square of toilet paper up against it while it’s running. If it stays, the fan is doing at least the minimum it should. And I’ll third Panasonic, they make some quiet yet powerful fans. ah, I am going to try this toilet paper trick. one of my new-ish bath fans never seems to be working well enough… thanks for the tip! i’m gonna go try this NOW!